Ms. Corinne Momal-Vanian has been the Director of the Division of Conference Management at the United Nations Office at Geneva since 2015. 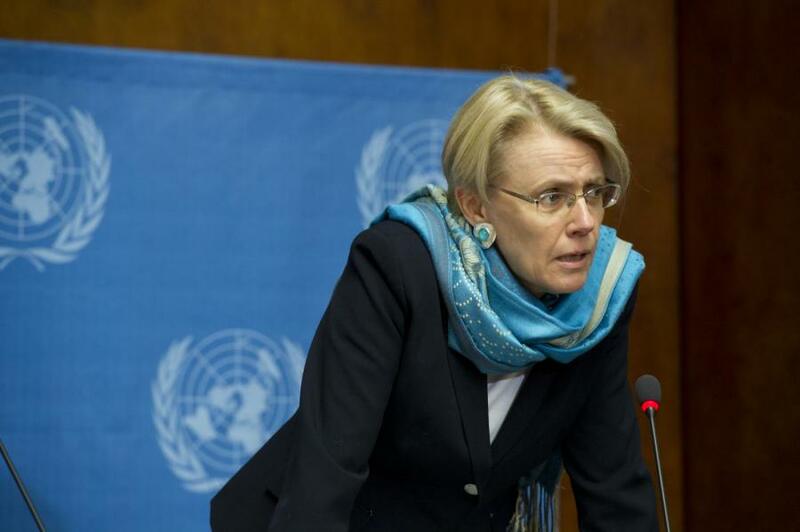 In the 30 years of her career she was Director of the United Nations Information Service in Geneva and Special Assistant to the Secretary-General and the Deputy Secretary-General in New York. Past assignments have also taken her to Bangkok and Baghdad. Gender is a cross-cutting issue in the 2030 Agenda. What role does it play in your work and how can the work on gender facilitate change with regard to the broader development agenda? Gender plays a role in my work in two ways. One is the specific responsibility that the Director-General has given me vis-à-vis the International Gender Champions network. That is obviously only focused on gender. It has opened my eyes to a lot of things and it has allowed me to hear a lot of best-practice examples from various organizations with regard to being more inclusive and promoting women’s careers. The other role that gender plays is within my own Division. We have a very balanced Division, with women and men occupying about the same percentage of posts at all levels, including at senior levels. In fact, we now have more women than men at the D-1 level. Gender plays a role because I see the different dynamics within the Division. I see that, although the Division is balanced overall, we have pockets where there are still many more men at the senior level than women. That is very particular to the linguistic professions. Because of their staff composition, the UN’s language services tend to be more homogeneous culturally than the rest of the Secretariat, which brings specific challenges. There, the gender issue has to be tackled in very specific ways. Speaking about you, do you remember what you wanted to become when you were a child and did you realize your dreams? Yes, my father was a diplomat and we travelled a lot. I lived in Egypt in the 70s. Blue helmets were deployed after the war between Israel and Egypt in 1973 and I remember being aware then that there was such a thing as the UN and that they were taking care of implementing cease fires. That got me very excited and that’s when I started being very interested in the United Nations. I remember a job fair in high school in Paris with different people presenting their jobs. There was a poor lady who was an accountant. No one wanted to talk to her because teenagers never dream of becoming accountants. So, the teacher said: “Come and speak to this poor lady, no-one wants to speak to her”. So, we went to speak to her and she asked: “What do you want to become?” and I said: “I want to become a diplomat”. And she said “…but for real? You know, we all have these dreams, my brother wanted to be an astronaut and I wanted to be a cinema star. But what do you really want to be?”. She thought that being a diplomat was unattainable, something that young people dream about. She didn’t see it as a concrete profession. So, definitely, I always knew I wanted to be in international relations, either in the French foreign civil service or as an international civil servant and I was very lucky that, like you, I had the opportunity to pass the NCE. And from there, how did you go about crafting your career and finding the place that was a good fit for you? You know, I never had a long-term plan. When you joined through the NCE you were expected to stay throughout your career. It was clear to me that the UN was going to be my employer. My father had been with the Ministry of Foreign Affairs all his life. So, I had this in mind, but, within this career path, I didn’t have any specific plan. I started in a Regional Commission, like you, but in Baghdad - the Economic and Social Commission for Western Asia was then in Baghdad. It was a hardship duty station. It was during the war between Iraq and Iran. But it was a very good place to start, I learned a lot. However, I wanted to move to New York, which I managed to do after two years. That’s when I was recruited by Michal [Møller]. I transferred to New York in 1990. They didn’t even have a proper vacancy system. It was really about how you knew that a post was becoming vacant. After a year in Baghdad, I went to New York during my leave in the summer and met the only person I knew. He was the HR officer who had called me to say: “You passed the exam and we have a post for you in Baghdad”. I talked to him and he made me meet a couple of people. And I met Michael [Møller] and a little bit later he said: “There is a P-2 available. Would you come?”. So I went. This is just to say that the rest of my career was like this. I talked to people, I saw what was going on. I never had a distinct plan. I never saw myself as Director of Information, I never saw myself as the Director of Conference Management. These things came up at the right time and that was it. And where there any roadblocks on the way, that may or may not have been related to being a woman? And how did you go about that? I was very, very, very conscious all the time of my family responsibilities. When my children were young I decided quite early on that I would not apply for posts that required extensive travelling or long hours. For example, I was always drawn to humanitarian work but I knew that this would require extensive travelling which would not be compatible with me spending good quality time with my children. I chose a number of more stationary jobs. It was a choice. I didn’t see it as a road block. There was one time, when I was already in the Office of the Secretary-General and I deliberately made the choice of applying to a post in Geneva, rather than staying in the high-powered Secretary-General’s Office. Many people probably would have thought that this was a career dead end, but my kids were very young and I thought that this was a good time to do it. I have no regrets. Every job that I have had has been extremely interesting in a way. Yes, on a couple of occasions I have had bosses that have made me feel that my family responsibilities might not be compatible with my work. The first time was when I had just delivered my first child. I came back to the office where I was Special Assistant to an ASG and she was very upset that on my first day I left at 6 pm. When she was looking for me at 6.30 pm, she said to her assistant “Well, the baby or the career, she’s going to have to choose”. Luckily, Michael intervened after that and persuaded her to give me a chance. She gave me that chance and I worked extremely well with her afterwards. But she was very driven and once, much later, after we had worked together for a couple of years, she said: “I think you are making the right choice by devoting more time to your family, because I have given up too much and sometimes I have regrets”. It’s good to be able to look back and not have regrets. It’s a matter of choice. I had a similar situation with another high-powered woman, again working in the Office of the Secretary-General. Interestingly, it was mostly women who made me feel that I wasn’t spending the time at the office that I should have spent. I would drop off my kids at school and then come to the office. New York is a big city, and most people in the office in New York start much later than in Geneva, they start later and they end up later. I would arrive at 9.30 am in the office and she said: “That’s just too late and I don’t understand why you can’t be here earlier”. So that was a bit tense. …you have always worked full time? Yes, I always worked full time and I never took special leave without pay after the birth of my kids. I worked full time, but I was very clear that at 6 o’clock I was out of the office. I was famous in the Office of the Secretary-General for having my stroller. I would drop off my daughter in the morning and at 6 pm, they would see me leave with my stroller and they knew it was 6 pm, because Corinne was leaving. I think you have to make your own rules, because nobody is going to make them for you. You have to make your own rules but you have to be very honest with your employers that this is what works for you. Some will accept and some won’t. Did you have any role models or mentors? What kind of support was important along the way? Definitely, Michael [Møller] has been an incredible mentor all along. In many ways, stepping in and suggesting to my boss at the time that quality of production was maybe more important than the time spent in the office and giving me a chance when he recruited me from Baghdad. He then also pulled me back to New York, when I had come to Geneva to work at the Joint Inspection Unit for six years. He suggested to Kofi Annan to take me as a Special Assistant which was very important for my career. And Kofi Annan himself of course. He was an extraordinary person who showed me that a leader can be courteous and humane. Kofi Annan always had a polite word to say, asking about you and your family. He was a role model in showing that being genuinely interested in people is compatible with working hard and performing well, that you don’t need to be aggressive. Most importantly, both of them never ever lose sight of the big picture while it’s so easy in our daily work to lose sight of the big picture of what the UN is trying to achieve. Those have been very important influences on the way I see my work. We already touched a little bit on work-life balance and combining a career with a family. Any more advice you can give? I want to give another example. When we went back to New York after a few years in Geneva, my husband also worked for the UN. Obviously, having a husband who was very supportive was very important. We managed to move together from New York to Bangkok, from Bangkok to New York, from New York to Geneva, from Geneva back to New York, and so on. It took efforts. The organization doesn’t take care of it, that’s clear. When we went back to New York, my husband said: “No problem, this is an incredible opportunity. You are going to work directly with Kofi Annan, as his Special Assistant”. He took leave of absence and came to New York with me which was great because he took care of the kids. At the time, there was very little remote work and telecommuting. This was in 2005. He was working in UNOG and UNOG asked him if he would work for them remotely from New York, part time. It was an ideal situation. We never would have thought this would be possible. But it worked, because they had the need. So, sometimes the organization can be flexible. When he was appointed to Bangkok, I had to find a job for myself, so I went around and asked what was available. There was a post in the Information Service in Bangkok. I went to see DPI in New York and said that I understood there was a post vacant and I asked them if they could take me on temporarily, for a year and a half, two years maximum. This way, they wouldn’t be stuck with me if they didn’t like me, and I said that I thought that I had the qualifications. I was very young and I would never dare to do this now, but it worked. And the organization was flexible in sending me on assignment. I kept my post in New York. It’s never easy. The organization will not be pro-active in helping your career as a woman, but if you have a proposal, the organization often says “yes”. Do you have any other advice to give to the mid-career women working in international organizations? I would give the advice not to stay too long in one place, because then you get really branded and specialized. The contradiction of all these international organizations is that most jobs are really generalist jobs but, at the same time, when they recruit, they look for specialists. So, I would say, try to move every 5 years at least, unless you like it and that’s what you want to do for the rest of your life. Some people are very happy to deal with, say transport of dangerous goods, because that’s what they want to do. But in general, if you want a good career, I think you have to move. The issue of networking is often debated by women. For me, spending significant time with my children meant not to go to receptions and other activities outside office hours. I never purposefully networked in the sense of going to receptions or events just to distribute my card and make myself known. Since we don’t have much time to do this, I think we need to build a reputation as someone effective and I think that’s stronger than going to receptions. Everything is about being known as someone who can deliver. If you deliver, people will be very happy to hire you. You have to build this reputation as someone who is solid, who is responsible. First, you make yourself known in your immediate environment and then you try to be part of departmental task forces, interdepartmental task forces, working groups, and so on. That’s how people learn to see you as someone who will work. For me, that’s more effective than just knowing people. That’s fine, too, but we don’t all have time for it. Any final message for International Women’s Day? I think, this is our time! I see tremendous evolutions and I don’t think I need to provide so much advice to women, because, frankly, they are seizing the opportunities. I see it everywhere. Actually, my worry today is about the guys. I see them somewhat in retreat, disengaged. I have several examples within my Division. Every time we ask for something which is not within people’s immediate terms of reference, it’s the women who step in. For instance, I called for volunteers to respond to an innovation challenge. There are 600 of us in the Division, half women, half men. Of the twelve people who volunteered, eleven were women. Yet I am sure that some men are interested in innovation. I am worried about the men falling back. We still have half of our work force made up of men. So, for women, I don’t think they need my advice, they are stepping in, they are seizing the opportunities. Maybe they need to learn a little bit how to navigate the organization. Otherwise, they have it all together. I actually start to think that I need to give advice to men! We’ll dedicate our next interview to that! Thank you so much for taking the time!